Even though my new books are calling me I have some good stories going on right now that I wanted to tell you a bit about. First, there’s The Friday Night Knitting Club by Kate Jacobs. Georgia Walker is a single-mother and business owner who is juggling the demands of a successful business, raising a tween and now the re-appearance of an ex. Thanks to her employees and friends who gather at the shop on friday nights, she finds a sense of calm and comfort in day. I hope that when I finally decide to go take some knitting classes I can find a cute shop like this one. River of Darkness by Rennie Airth is a mystery set in rural England right after WWI. Having just lived through the horrors of war a small community is in shock when five people are murdered. I’m not very far into this but I really enjoy reading about how the police force was starting to use more scientific methods to solving crimes and how it wasn’t so easy to introduce such revolutionary methods. I can’t quite make up my mind about the Inspector but I think once I get to know him more I’ll find out there’s a reason he comes across a bit boorish. 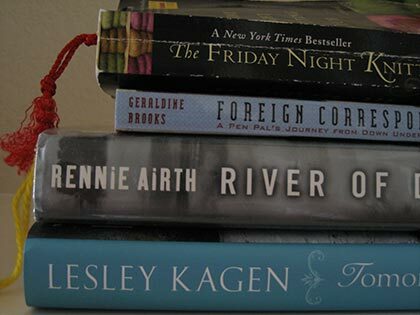 Finally, I am also reading Tomorrow River by Lesley Kagen. 11-year-old Shenny is trying to hold things together for her family since her mother disappeared. Her twin sister has stopped speaking and her father becomes more volatile each day. For it having such a sad premise, there is actually quite a bit of humor in this story. Shenny is always quick with a funny quip but I get the feeling as the story progresses I’m just going to end up really upset with her parents. So those are my current reads, and yes, of course I’m still glancing over at the pile of new books. I may throw in another to the mix so I’ll keep you posted. Happy reading, Iliana! Hope you have a great weekend ahead! I like Rennie Airth: I’ve read ‘The dead of Winter’ and ‘River of Darkness’ both very good and I’m always on the look out for more from this author. The Geraldine Brooks book sounds cool. I have had a pen pal since third grade. We haven’t written each other in years but we still keep in contact through Facebook and she was even able to come visit me in the states a few years ago so we could meet in person (she’s from the UK). Love the sound of Foreign Correspondence! I had sooo many pen pals when I was young and even some in my 20s but I’ve lost touch with all of them now.. I haven’t heard of any of these before other than The Friday Night Knitting Club but they all sound really good. I hope you enjoy reading them all! Jennifer – I’m glad to hear you enjoy this series. I haven’t picked it up again so I’m still very much in the beginning but hoping to make more of a dent into the book this weekend. Stephanie – That is so great you still connect with your pen pal! I think nowadays it would be harder to keep up with pen pals because it’s just so convenient to use email and other social networking sites. pinkilili- It’s sad to lose touch with pen pals but it seems that just sort of happen. Letters get lost, people get busy, etc. Happy reading to you. I am looking forward to your reviews! I read the Airth book quite a while ago–when it first came out and have completely forgotten the details. I wouldn’t mind rereading it or reading one of his newer books. I would love to read the Geraldine Brooks book–I had penpals when I was young as well, so the topic is interesting to me. I’ll be curious to hear what you finally make of it. Danielle – I really hope I like it so I can follow the series. I think so far it has a lot of potential. I’ve gotten a bit more into the Brooks book and it’s good but not exactly what I thought. I promise to post more on it soon. The Geraldine Brooks book looks really interesting! I had never heard of it before, although I have quite a few of her books on my shelves.